Stealth warfare against the Russian economy may be encouraging capital outflows, but for Russians on the home front, glasses are still being raised with a growing volume of sparkling wine or champagne going down the hatch. Abrau-Durso, the only Russian winemaker listed on a public stock exchange, is also going up, and like the bubbles, defying threats from Washington. A new report by IWSR, the London-based bible for wine and spirit marketers, has just reported that last year, despite an overall decline of 1.3% in Russian consumption of all wines, champagne drinking grew by 4.4%. Measured in thousands of 9-litre cases, the total wine volume consumed was 103.9 million. Champagne, which comprises just 0.1% of this aggregate, made 118,000. For this year, IWSR is forecasting Russian champagne consumption will grow another 5%. Other sparkling wine, of which 26 million cases were consumed in 2013 (2.2% less than in 2012) is forecast by IWSR to drop by another 2.7%. But again Abrau-Durso is the exception to the trend. Champagne is, of course, a French import. Its recent and expected growth is not at the high end, where the Russian taste for Dom Perignon and Krug has been in retreat. Moet & Chandon, Billecart Salmon, Lanson, and Laurent Perrier have been gaining in their place. But their bottle and case numbers are small. 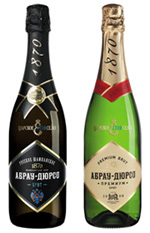 Much bigger numbers have been consumed of the premium Russian sparkling wines – Victor Dravigny, Imperial Cuvee Alexander III, Russkoe Shampanskoe, and Abrau-Durso, all brands from Abrau-Durso’s vineyards west of Novorossiysk, in the Krasnodar region. With last year’s total sales of just over 2 million cases, Abrau-Durso’s sparkling wine is being consumed at a rate of nearly ten bottles to one of French. The Russkoe Shampanskoe label, for example, was up 31.8% last year to 1.6 million cases. These include brut, semi-dry, and semi-sweet blends of pinot blanc, pinot noir, chardonnay, aligoté, and riesling; as well as semi-sweet sparkling red and rose. Drobiz believes that a 10% increase in excise has relatively little impact on drinking preferences. But the much larger increases the federal government has scheduled to 2016 are driving Russians to switch towards still wine, and sparkling wine suppliers towards the black market. The biggest share of demand, Drobiz believes, is for sparkling wine of up to Rb200 ($6) per bottle. This favours domestic winemakers over the imports. Alan Sokolov, director of the Association of Sparkling Wine Producers in Moscow, says he is expecting the volume of domestic production this year will grow. “Taking into account draft laws about tightening responsibility for the production and trafficking of illegal alcohol, the coming establishment of minimum retail prices for champagne, and other measures aimed at regulating the market, the decline in the production of sparkling wines will not just stop, but perhaps grow by 5% to the end of 2014.” At the same time, the decline of the ruble against the euro and higher customs duties are putting a brake on growth of imports of low-priced, foreign-made wines. Pavel Titov (below left), who is chief executive of Abrau-Durso and a director of the company with his father, Boris Titov (right), the controlling shareholder, have announced plans to expand production of both low-priced and premium brand still wines this year. The two Titovs appear in UK company registration documents to have controlled Abrau-Durso through Solvalub Trading Ltd., a company registered on the Channel Island of Jersey. Russian market shares of the leading sparkling wine producers have been dwindling for Abra-Durso’s competitors, according to figures provided by TsIFRRA. In 2012, it was running fourth behind Igristie Vina with 19% of production; DZIV, 10.6%; and MKSHV, 8.4%. Abrau-Durso’s market share that year was 7.2%. According to figures for the March quarter of 2014, Abrau-Durso now leads with 16.9%; DZIV, 15.3%; Igristie Vina, 12.5%; and MKSHV, 5.9%. If market share is calculated for shipments to customers, Abrau-Durso’s market share rises to 19.8%. Since the accession to Russia of Crimea, Boris Titov has said he would consider the possibility of adding Crimean vineyards to the company’s production. During 2013 the volume of Ukrainian wine imported to Russia fell by 30% overall to 234,000 cases. 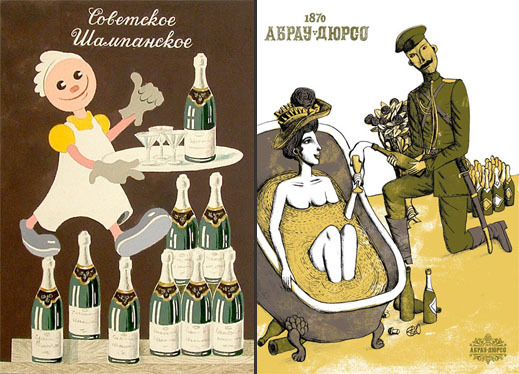 Two of the wine labels – Sevastopol and Krim Selekt – came from Crimea.